The We-Ko-Pa Resort & Conference Center is an award-winning resort in Fountain Hills near Scottsdale and east of Phoenix, about 25 miles from Phoenix Sky Harbor International Airport (PHX) and about 17 miles from Scottsdale Airport (SDL). The resort has nearly 250 rooms and suites. As you would expect at a conference resort, it is well-suited for meetings and events. The Wassaja Conference Center has 25,000 square feet of flexible meeting space including six breakout rooms and an 18,000-square-foot ballroom that can be divided into nine separate meeting spaces. The We-Ko-Pa Resort is an enterprise of the Fort McDowell Yavapai Nation. Check guest reviews and prices for We-Ko-Pa Resort on TripAdvisor. From fall through spring resort guests may participate in a two-hour cultural heritage experience. During the Yavapai Experience, you can interact with Yavapai tribal members, learn about the tribe's culture and history and take a guided walk on a nature trail. Factoid: We-Ko-Pa means "four peaks" in the Yavapai language. Four Peaks is a part of a wilderness area in the Tonto National Forest. The peaks, rising to an elevation of about 7,600 feet, can be seen from many of the rooms at the resort. Whether you are attending a conference, have a group of guys on a golf vacation, or are just a couple enjoying a leisure time staycation, the We-Ko-Pa Resort has amenities to make your stay a pleasant one. 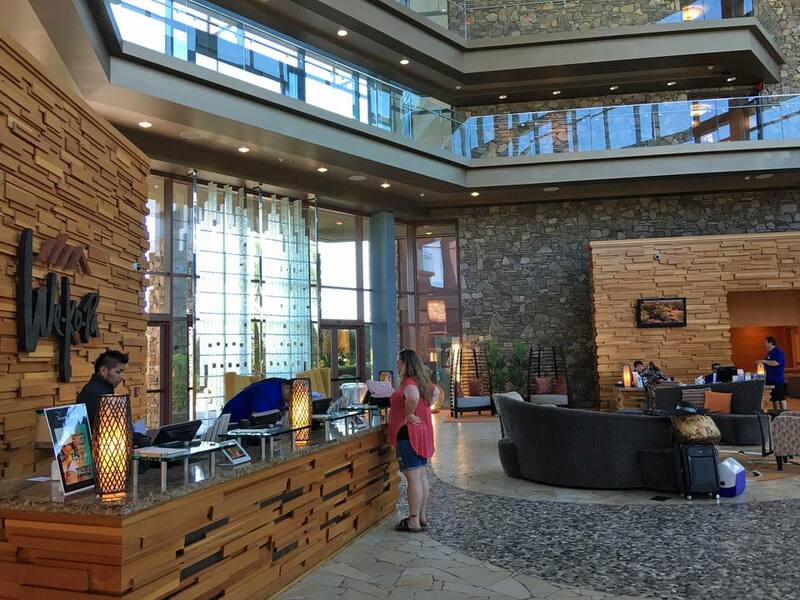 Fort McDowell Casino is about half a block from the lobby of the We-Ko-Pa Resort, making it a logical place for entertainment -- gambling, sports TVs, live local bands and dancing -- after a day of conference meetings or lounging by the pool. Slots, keno, cards, and bingo will keep the gamblers busy. From time to time, Fort McDowell Casino will host big-name bands for outdoor concerts. The Amethyst Spa & Boutique provides popular treatments as well as salon services, massages and facials. It's a small spa compared to other resorts and may be open by appointment only. There is a small but adequate fitness center on the premises. The We-Ko-Pa Golf Club is a short shuttle ride away. There are two 18-hole championship courses here. One of the best courses to play in the area (but it can be pricey in high season! ), I can't tell you which course is the favorite, Cholla, the original golf course, or Saguaro. Even if you aren't a golfer, you might want to stop by the pro shop and see a great selection of We-Ko-Pa logo clothes and accessories for both men and women. Both courses boast panoramic desert and mountain scenery - with no homes, condos or townhomes lining the fairways or interrupting the views. The Cholla 18 has a higher rating/slope than Saguaro and provides a desert golf experience. It is described as a "target golf" design. Saguaro has wider fairways and is less spread out, making it more suitable for those who prefer to walk a course. Both courses have won many awards, and both are public courses. As always, check with the pro shop about course closures for course aerification schedules and reseeding in the fall. Check the We-Ko-Pa Resort website for special Stay and Play packages that combine a resort stay with a golf outing. Arizona residents with ID get a better rate than the general published rate! Adjacent to the two heated pools and two spas you'll find a small, recreational putting green (they will lend you a putter). There are nice shaded areas here where you can read or just relax. Ahnala Mesquite Room, open for breakfast, lunch, and dinner, specializes in authentic Arizona cuisine with a Southwestern twist. Resort casual attire, or even nice shorts and a tee shirt, are acceptable here. The dining room isn't huge but it is comfortable with ample spacing between tables. Since this is a conference resort, be aware that larger groups in the restaurant and in the lounge can make it a noisy experience. Factoid: Ahnala means "tree" in Yavapai, and since most of the trees on Native American soil are mesquite trees, the restaurant features mesquite marinades. Because everyone is different and travels differently, features that appeal to one person might not be important to another, and vice versa. The location. This resort is definitely off the beaten path, surrounded by desert and not much else as far as the eye can see. The highway is not close enough to add noise. Big city locals will enjoy open spaces and quiet. The casino is about a half a block walk from the resort. It has a large bingo room (not all local casinos have one) and there is a nonsmoking area of slots. If you want a change of pace from the resort restaurant, there are several choices here, including an all-you-can-eat buffet. There are faster, cheaper food options as well. Happy hour at Ahnala. They are named Poco Diablo Crab Cakes after a sister resort in Sedona. The crab cakes were delish, and so were the bacon-wrapped avocado slices were a thumbs up, too. We-Ko-Pa Grille at the golf course was a nice change of pace from Ahnala. While you can't see much of the golf course from the patio, it is covered and offers lovely desert views. It is open for breakfast and lunch. The free shuttle will get you to the golf course. You can also get a ride to Fort McDowell Adventures and even Fountain Hills. Keep in mind that if the resort has a large conference, transportation services might not be an option if you are on a schedule. Make sure you get a player's card at the casino after you check in; you might get a discount on food, beverage, golf or shopping at the store or pro shop. It doesn't hurt to ask! Looking for a place to have your wedding? This might be a nice option! All the rooms are in the main building; no long distances to walk outside. Free self-parking, close to the lobby. The location. This resort is definitely off the beaten path, surrounded by desert. Hey, it's listed as a positive up above! Yes, the resort is situated on the Fort McDowell Yavapai reservation, in a pristine desert. You won't be walking to shopping or off-property restaurants or a baseball stadium or a movie theater here. Some people will see this as a negative and prefer to be closer to Scottsdale or Phoenix excitement. Kids always love a pool and a putting green, but there are no camps for children, movie/video game rooms or other regularly scheduled activities for kids here. This is more of a resort for conferences, a golf vacation or a romantic getaway. A Junior Suite was spacious, with a full kitchen and plenty of comfortable seating, two [not large] televisions, a comfortable king bed, and mountain views. The bathroom was rather small (single sink, jetted tub with shower and shower curtain). The suite was decorated in shades of beige and brown, the artwork consisted of generic desert photography. There was no hint of Native American influence here. The resort is pet-friendly, and those bringing pets are typically provided with a first-floor room. Since there is no grassy area here where pets can relieve themselves, they'll be visiting desert rock. There is a resort fee. It covers in-room coffee, bottled water, high-speed internet, fitness & business center access (24-hour), daily newspaper, in-room safe, shoe shine and local telephone calls. Factoid: The lobby's woven baskets, kachinas and wooden wall and lighting decor incorporate Native American influences into the design. The We-Ko-Pa Resort & Conference Center is located in Fountain Hills near Scottsdale. It is east of Phoenix and north of Mesa, about 25 miles from Phoenix Sky Harbor International Airport. These attractions and activities are not far from the resort. These desert experiences are not to be missed! The Stables at Fort McDowell will bring out your inner cowboy and cowgirl while you mosey on horseback through the desert trails, crossing the Verde River on your way. Hayrides and other western-type entertainment may be offered. Trail rides usually take a vacation in the summer. Other experiences include Pink Jeep Tours (the same company that offers the famous Sedona tours), Segway Tours, kayaking and off-roading adventure tours. In nearby Fountain Hills, you'll find a park with an unusual feature. It's one of the most photographed spots in the Valley of the Sun! If you have Fido with you, there's a dog park in Fountain Hills. Saguaro Lake is about ten miles from We-Ko-Pa Resort.You can take a scenic, narrated tour on the Desert Belle Paddle Boat. It is suitable for all ages. In the heat of the summer, both locals and visitors alike take a leisurely ride on inner tubes down the Salt River. You may rent the inner tubes or you can bring your own. I recommend trying it on a weekday unless you like crowds. Here is how it works. Factoid: A “river” made of rocks winds from the hotel lobby through the parking lot to the We-Ko-Pa Golf Club, symbolizes the Verde River. As is common in the industry, the writer was provided with a complimentary meal for review purposes. While it has not influenced this review, About.com believes in full disclosure of all potential conflicts of interest. For more information, see our ethics policy. All prices and offerings mentioned herein are subject to change without notice. June 2016. We-Ko-Pa means "four peaks" and here is a view of those four peaks from a window! There are several outdoor areas where guests may relax, talk and just enjoy the environment. Another outdoor space at We-Ko-Pas resort & Conference Center. Enjoy the heated pool at We-Ko-Pa.
Entrees at Ahnala. On the left, the Boneless Short Ribs. On the right, the 12 oz ribeye with a smattering of hollandaise on the tip. This might make a great area for a cocktail party. Alternatively, one could definitely envision a wedding party conducting a ceremony here!